1. What is the exact location of Della Adventure in Lonavala? 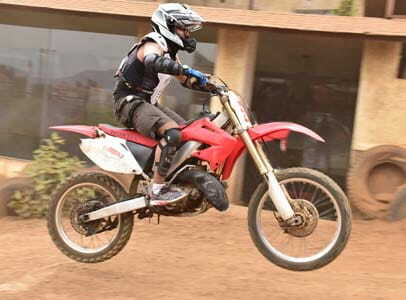 Della Adventure Park, Kunegaon, Lonavala – 410 401. Maharashtra, India. • 4 kms from Khandala Expressway Exit and 2.6 kms from Main road (Old Mumbai-Pune Highway). • From Chhatrapati Shivaji International Airport: 92 kms. • From Navi Mumbai (Vashi) : 74kms. • From Central Mumbai: 99 kms. • From Pune International Airport: 77 kms. You can download our customized Map and Directions on how to reach us from our Website in “Contact Us” section. 2. What are the Park Timings? 3. What is the criterion for kids pass? Kids below 2.6' height have no entry fees. Kids from 2.6' to 4.6' are eligible for Kids Pass. 4. Is the adventure park open during monsoon? Yes, the adventure park is open and functional all year round. Though, the park may keep some of the activities non-operational for safety reasons. 5. Apart from Adventure Activities, do you offer any kind of entertainment? Yes we do. We can offer you live entertainment like a DJ, bespoke concerts as well as Treks and a range of workshops including cooking, mocktail creation and Amphitheatre for social events. For further details please contact our Sales Team on +91 – 22 – 6745 1400 for Mumbai, +91 – 20 – 2556 0070 for Pune and +91 8975766095 for Gujarat. 6. Can I bring outside food and drinks to the park? Apart for infants and expecting mothers, guests are not allowed to bring outside food and beverages into the park. 7. What kind of food is available at the park? There are 5 different multi cuisine restaurants at the park. Please click here to know more. 8. Up to what age do you provide ‘free entry’ at Della Adventure? Free Entry for Children below 2.6' Height. Free entry for physically challenged citizens too. 9. What discounts are offered at Della Adventure? i)50% off on packages and activities for the Physically Challenged Citizens. ii)Rs. 200/- off to college students on show of valid college ID card on Weekdays only. 10. Are pets allowed at the Adventure Park & Resorts? Yes, we are a pet friendly Park & Resort. 11. Are pets allowed in Restaurants/Swimming Pool Area? 12. Do you have any special rates for Corporates? We can create a customized package for your company based on your requirements. For further details, please contact our Sales Team on +91 – 22 6745 1400 for Mumbai, + 91 – 20 – 25560070 for Pune and +91 8975766095 for Gujarat. 13. What kind of Corporate Training do you offer? We have a range of 29 Team Building Activities. 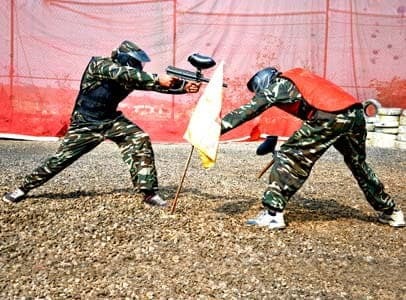 These include Paintball, all Rope activities, Knockout and Rappelling to name a few. For further details please contact our Sales Team on +91 – 22 – 6745 1400 for Mumbai, +91 – 20 – 2556 0070 for Pune and +91 8975766095 for Gujarat. 14. How many people are required to be eligible for group bookings at Della Adventure? Minimum 20 people are required for group bookings. 15. How many people are required to be eligible to do a Birthday Event Booking? Minimum 25 people are required. 16. How many people are required to be eligible to avail the Birthday Offer? Two and above (including the birthday person). 17. Can you name a few companies who have done events in your resort? Vodafone, The Times of India, Godrej, Cadbury, Wipro to name a few. Please check our Corporate Events section on www.dellaadventure.com for further details. 18. Are there reservations available for restaurants? Yes, we take reservations for the park restaurants for groups and other events which have advance booking with us. 19. Can I leave the adventure park and come back again on the same day without being charged? We do not encourage our guests to step out, as all the fun is happening inside the park. But in case of emergency, you can leave and re-enter with special permission from the management and go through the security checks. Rights of Admission are Reserved. 20. Are there any personal items which may not be permitted to bring to the park? Alcohol, Outside Food, Weapons of any kind, even slingshot, Fireworks, Illegal substances, Personal Sporting Equipment, Professional photography equipment or cameras with detectable lenses are not allowed. 21. Are there any new attractions or shows in the near future? MAC Attack, Kids ATV, Fish Spa and Mirror Maze are some of the new attractions added in April 2018. However, at periodic intervals, new attractions and shows will be added to the range of existing activities. 22. Do you have a baggage counter? Yes we do have a baggage counter facility, however they are limited and strictly on "first come first serve" basis. It is thus advisable to leave all your essentials for a day's outing in your car. 23. What is the best way to dress for a day at the adventure park? Is there any clothing which is permissible? In keeping with our family-friendly atmosphere, and for health and safety reasons, we strictly enforce a dress code. Proper attire must be worn at all times, including t-shirt and appropriate footwear. Clothing with rude, vulgar or offensive language or graphics is not permitted, and shirts cannot be turned inside-out as a solution. Sheer, mesh and see-through clothing cannot be used as a cover-up over bathing suits. Park admission may be denied if clothing is deemed by management to be inappropriate. T-shirt, Sports shoes, and a bottom (shorts, pants, etc) must be worn at all times in the Adventure Park. Sports shoes are available on rent as well *Subject to availability of size. 24. Are your activities affected by bad weather? 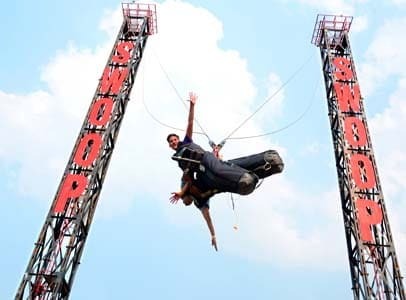 All the attractions and activities are designed to operate under any weather conditions. Although, a couple of activities may be open or closed depending on the services level. 25. Do I have to pay entry fees even if I am pregnant? 26. My leg/arm is plastered, can I still use your activities? Every activity has its own specifications that states which attraction can be accessed by Injured / Disabled / Pregnant etc. 27. Do you have first aid facilities at the Park? Yes, we have one Medical Center in the Park near Gaming Zone. 28. How long are your queues? The length of the queue is completely dependent on the number of guest visiting. 29. How do I reclaim an item of lost property? We have a Lost And Found Counter inside the park at A Zone, speak to the Service Attendant at the counter and he/she will help you locate and retrieve your lost property. 30. How is the connectivity at the park for mobile phones? Special arrangements have been made for mobile connectivity, with Vodafone and Idea. 31. Is there Wi-Fi service available at the park? Yes. Wi-Fi is available with minimum charges. 32. Can my special dietary be request be accommodated at the restaurants? 33. How can I find out about different restaurants at the park? Browse through the website to know more about all the park's restaurants. 34. Can I bring camera to the park? Guests can bring their personal cameras for leisure photography. SLR/DSLR cameras are not allowed. 35. What is the weather at Della Adventure? It is reasonably hot during summers, which lasts up to mid June. In June arrives the breath taking Monsoons. Lonavala is famous for its waterfalls and greenery. One needs to be adequately prepared for the torrential rain which occurs quite often. 36. Where are the Information Zones located at the park? At the entrance itself in the Arrival Plaza and all across the Park in all 6 Zones. 37. Are there ATM facilities within the park? Yes. We have an ATM facilities within the park, but sometimes non-operational due to network issues. 38. Can I upgrade my package? Yes, only for walk-in guests/passes & provided none of the activities are used. Online passes are non-upgradable. 39. Can I get a refund of my ticket? 40. Is alcohol served at the park? Park regulation prohibits alcohol brought from outside the park. However, alcohol will be served inside the park in PNF, Parsi Dhaba and Café 24 restaurants. 41. What is the pricing structure like? You can know more about the package prices, custom packages and activities here. 42. What are the Terms & Conditions for College Pack? 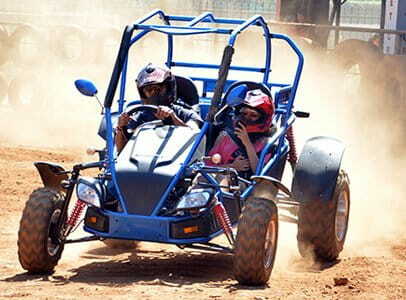 Valid Student ID card to be presented to avail the Della Adventure College Package. Only one ticket will be issued per Valid Student ID. Vouchers will not be reissued in case it is lost, misplaced or misused in any form. College Package not valid on Saturday, Sunday & Holidays. Adventure packages, rates and governing conditions are subject to change without notice. Copyright © 2018 Della Adventure & Resorts Pvt Ltd.